Now I may sound like a Bible beater yelling up a revival at a river crossing camp meeting, but that don’t change the truth none. There’s right and there’s wrong. You got to do one or the other. You do the one and you’re living. You do the other and you may be walking around, but you’re dead as a beaver hat. 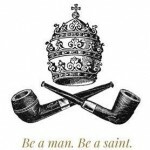 I discovered The Catholic Gentleman blog via friends’ Facebook posts in the past week or so, and while I haven’t read enough there to endorse it wholeheartedly, I enjoy what I see at a cursory glance. 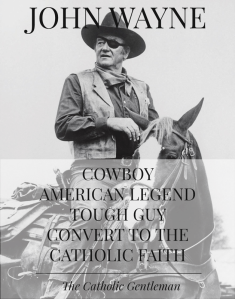 This morning, I especially enjoyed a post The Catholic Gentlemen shared about The Duke’s conversion to Catholicism late in life, linking to this CNA interview with John Wayne’s grandson, Fr. Matthew Muñoz. He was not a perfect man, but a persistent, nagging faith (and the prayers of a good woman or two) appear to have brought him to the Truth in the end.